Introduce your kids to music with this well-known wind instrument! The saxophone is a member of the woodwind family although it is usually made of brass. 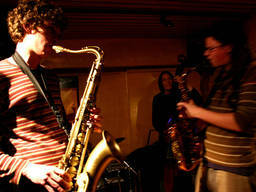 Well known for its sultry sound, the saxophone is popular in jazz, popular and big band music. If your kid is bored by classical music, the saxophone could be the instrument for them! See how easy having fun with saxophone is. Your kid will need to get used to his instrument but will quickly ne able to make some nice sounds, and soon play some good music. Will Your Kids Enjoy Playing the Saxophone? Do your children yawn at the sound of the symphony orchestra? What about choosing an instrument with a bit more of an edge? The saxophone is a single reed instrument which is played by blowing into a mouthpiece and covering holes on the body of the instrument to make the notes. Once mastered, your kids will enjoy learning their favourite pieces of music and performing them either as solos or as part of a band. Not sure what age to start? Around age 8-10 is considered good for wind instruments as they require a fair bit of strength and co-ordination to play. It’s best to start kids off on an alto saxophone and then let them progress to a soprano, tenor or baritone instrument when they are ready. How Can You Organise Saxophone Lessons for Your Kids? If you are looking for private lessons for your child, a quick search in our ActiveActivities Directory will help you find your closest saxophone school or teacher. Tuition usually costs around $60 an hour and your child will probably need to purchase their own instrument and music sheets to practise at home. Once they have become proficient, your child might like to get involved in musical kids’ activities like their school orchestra or local kids’ bands. Check out your local music academy for activities in your area, particularly during the school holidays. Not sure what instrument would be best for your child? Renting is a good way to get a feel for different instruments before you make a big financial commitment. A new saxophone will cost you around $1000 and a second hand model $600 so it is important to make sure you get the right instrument! If you are looking for other musical instruments or similar activities for kids, there are other instruments in the woodwind family including the clarinet or flute which your child might enjoy. The saxophone can be a great starting point for kids who want to develop their interest in music and learn to play an instrument. Who knows where it could lead!